Sign Up for the Billy DeCarlo Newsletter Below! Be the first to know about new books and deals! I will never sell or give away your email address. Below you'll find all of the exciting news about all three books in the trilogy, including tidbits about audiobooks, free giveaways, a boxed set, and more. Book III: The Candidate is here! Intro price of $2.99 for a short time, Kindle Unlimited for the next 90 days only. Read it now! The boxed set of all three books is available on Kindle (audiobook coming in a few days). See the pic and details at the bottom of this email. If you are a Kindle Unlimited reader, please read Book III: The Candidate in the next month or so. I put it in KU for a limited time only to be fair to my KU readers, but like many authors, I'll be forced to pull the books out of KU for wider distribution due to some changes in Amazon's policies (we don't get paid if readers read books in page-flip mode). In order to (hopefully!) recoup what I've spent in editing, covers, marketing, etc I need to make the books available to a wider audience on iTunes, Kobo, B&N, Google, and other reader platforms (as well as Amazon, of course). If you are an ebook buyer (rather than a KU subscriber) please buy Book IIInow at the introductory $2.99 price! I want to thank you for your support, and again beg you to take a moment to click some stars to rate or review my books on Amazon or Goodreads. It really makes a difference in qualifying for certain promos to help get the word out. Also, don't forget to visit the billydecarlo.com website to sign up for the newsletter (if you were forwarded this from a friend), read the blog (you get the scoop first as a newsletter subscriber! ), or participate in the forums and discuss the books. I'm planning my next trilogy, stay tuned! If you can, I would be very grateful if you could please spread the word about my books via your social media accounts. Thanks in advance for any help! In the exciting conclusion of the Vigilante Angels trilogy, Tommy finds himself on the run and hiding in the Florida Keys. He’s prepared to let his disease claim him and die in peace. That is until he finds love and a mysterious rejuvenation. He begins to follow the meteoric rise of a politician that stands for everything he despises and sees one last chance to make the world a better place before dies. He battles alcoholism, love, cancer, FBI investigators, neo-Nazis, and many unexpected obstacles to complete one last mission. In the race against time, which will prevail? Vigilante Angels Book II: The Cop should be out in audiobook within a week. I've updated it to fix a few minor typos, in case you've seen updates on your Kindle. Reviews have been great so far, but I can always use more! You can order the Kindle, audiobook, or paperback at this link. 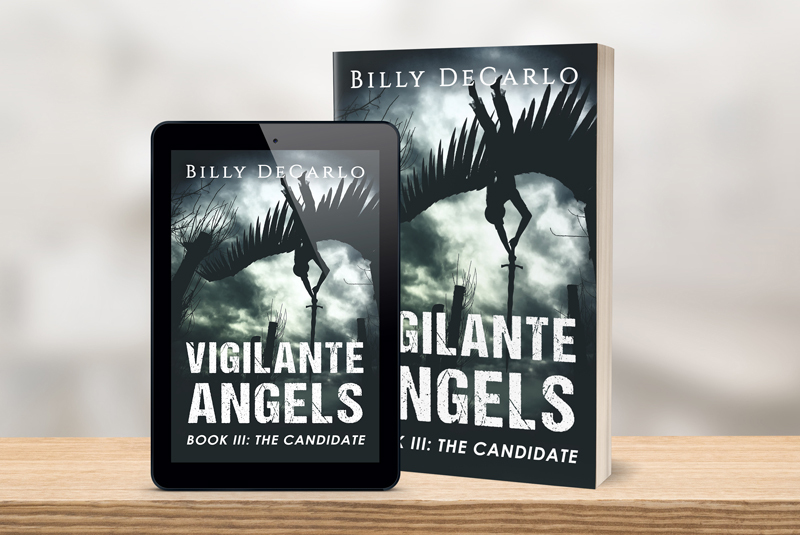 As with all Vigilante Angels books, if you buy the paperback you get the Kindle version free with the Kindle Matchbook program. Vigilante Angels Book I: The Priest audiobook is now available! You can order the audiobook, paperback, and Kindle version at this link. 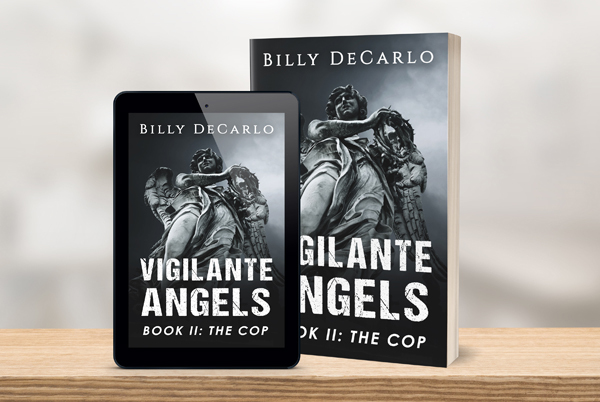 As with all Vigilante Angels books, if you buy the paperback you get the Kindle version free with the Kindle Matchbook program. There is a Goodreads free giveaway contest (ends on Dec 11) for signed paperback copies at this link. In other Book I news, someone is working on the screenplay! So...who knows, maybe someday it will hit the big (or little) screen. The complete boxed set is now available in Kindle ebook (audiobook coming early October) at this link! I'm posting today primarily because I just sent up a new version of Book I: The Priest and some of you may have seen that update on your Kindle readers. The only changes I made were to fix a few typos (discovered while reading through for the audiobook and pointed out by a few astute readers - thanks Helen! ), and to update the preview of Book II: The Cop. I wanted to let folks know why they had a new version pushed to their device, in case there's any confusion. In other VA news, I had been going back and forth in my mind about the cover for Book II: The Cop. I had originally liked it, but it kept nagging at the back of my mind that it was perhaps too busy and muddled. I wanted to stay with the angel statue theme, but introduce the 'cop' theme of that book as well, and ended up trying to do too much, and as a result it was too busy and didn't present well in the all-important thumbnail view. So, I once again begged for forgiveness from my awesome cover design company, Archangel Ink and asked for a change. I think that's okay, since it is only on pre-order and hasn't officially published yet. I've attached the new cover to this blog post. I struggled whether to send that cover update to my newsletter subscribers first, since I had promised them the early scoop on things in reward for their loyalty. But, since I had just sent out a newsletter to them, and promised not to spam, I was kind of caught in between. Since the new cover for book two is being pushed out to Amazon today, I decided to just put it here, in the blog. It hurts a bit to see unsubscribes from the mailing list and I've been very lucky that way so far, so I didn't want to risk it! The newsletter subscribers (you can sign up at the bottom of the page at https://billydecarlo.com) will get to see the Book III: The Candidate cover first, and I really love it! It perfectly symbolizes Tommy's journey, at least where it goes in that book. To update folks on my status, I've been juggling quite a bit lately. In addition to working on the audiobook for book one (it's fully recorded and in mastering/edit phase, should be out within a week or two, I hope! ), I've been getting editing and beta-reader feedback on book two (hope to also have it out in a little more than a week - earlier than the July 28 pre-order date! ), and *trying* to spend time on book three. I'm very excited about where the story is going (or rather, where it has taken me!) in books two and three. I'm hoping that my writing gets better in each book, and thank you for all tolerating my learning process and rookie mistakes, being a bit too preachy in places, etc. It's a journey! To summarize, by mid-July my plan is to have the book one audiobook out, book two out in paperback, Kindle, and (hopefully) audiobook, and book three on pre-order. After the one-month intro deal on Book I: The Priest ends on July 7, I will change the ebook price from the intro/promo price of 99 cents to the regular price of $2.99. It will stay there until around August 9, when another 99 cent promo will run. I'm hoping things will take off, since I took quite a beating at 99 cents, due to the expense of the promos, covers, editing, etc. That's why your reviews and social media promotion are so important, that part is free for authors :-) When I have book two out, and book three on pre-order, I may set book one to a permanent teaser price of $1.99 to introduce the series to readers (who will hopefully then buy the sequels). As soon as any of those are firm and have dates attached, the newsletter readers will hear about it first, and then I'll post here on the blog. In the meantime, please keep the reviews coming on Amazon and Goodreads, they really do make a difference in terms of qualifying for the sought-after promotion sites (and sales of course), sign up for the newsletter if you haven't already, and sign up for the forum at billydecarlo.com and start a thread/discussion, or ask me questions on my Amazon or Goodreads author pages! Let your friends know about the free Goodreads giveaway (signed, personalized paperback copies). Thanks, TGIF, have a great weekend and a wonderful and fun 4th of July weekend for those of you in the USA! The first newsletter went out earlier this week to everyone that was on the mailing list (you can sign up at billydecarlo on the bottom of the page). If you signed up and didn't receive it, check your spam folder. If you are just signing up now and want to view it, you can see it at http://mailchi.mp/0a9451a11d28/vigilante-angels-update-1. It's chock full of Vigilante Angels news! I'll summarize some of them below, but check the newsletter for full details. 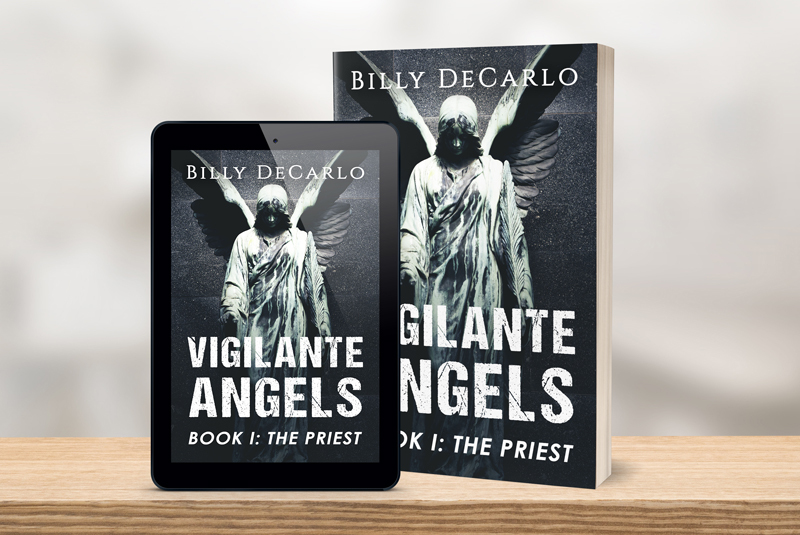 Vigilante Angels Book I: The Priest is doing well in the Amazon charts and has hit bestseller status in the Noir and Crime categories! It is available at http://amzn.to/2rPsGiv. Treat yourself or a friend to some dark, gritty beach reading. The Kindle edition is 99 cents, or free if you buy the paperback. The reviews have been great so far, but I can always use more if you can spare a minute and a sentence. I'll be working on the audiobook version this weekend. I could use some reviews and social media coverage if you read it and can spare a minute and a sentence or two. Constructive feedback also welcome via email. Book II: The Cop is also up for preorder at http://amzn.to/2rOX4w3, with a delivery date of July 28, but I'm shooting to get it done and published much earlier than that if I can swing it. It is now in the hands of the editors! It has some great twists and surprises in Tommy's journey. Like Leonard Cohen said, you want it darker. Book III: The Candidate has a cover, which will be revealed in the next newsletter. It's pretty awesome, if I don't say so myself. I'll be working on the plotting and outlining this weekend. Sign up for the discussion forum at https://billydecarlo.com/index.php/forum/index to contribute your ideas or ask questions. I have a busy weekend ahead! this is a test comment to what's new.